I went in for some scouring pads and got distracted by pumpkins. 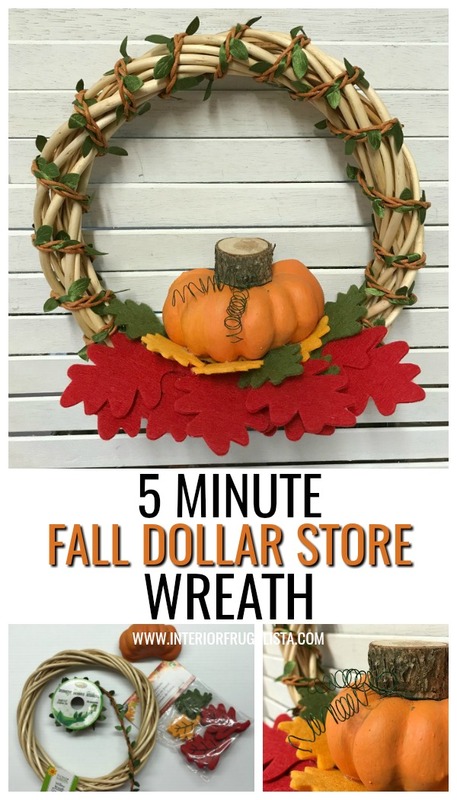 Next thing you know I'm replacing my plastic basket for a shopping cart and an hour later I walk out with everything I need to make a 5 Minute Fall Dollar Store Wreath and a whole heck of a lot more. Does that ever happen to you? 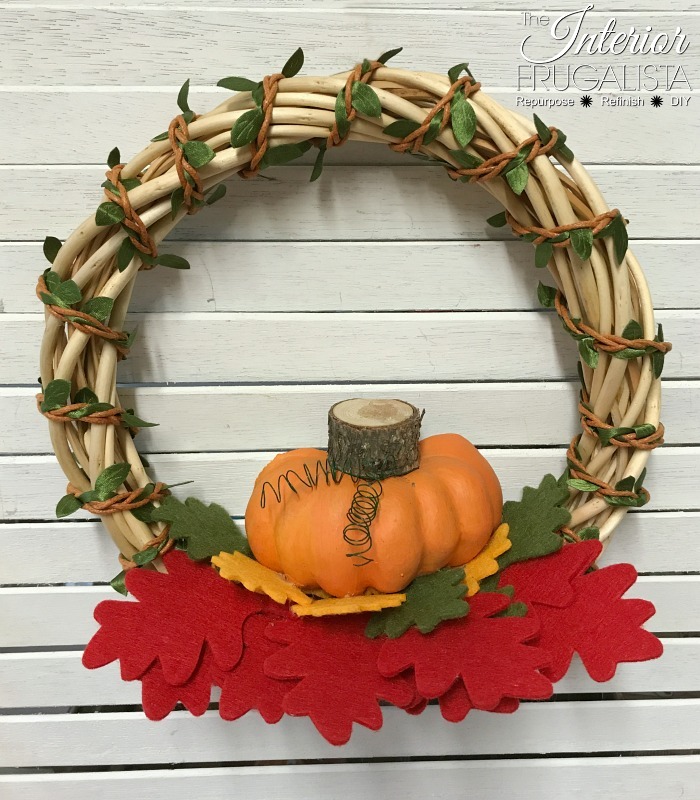 The wreath practically made itself without my having to think about it as a little bit of this and a little bit of that landed in my cart. Oh, and those pumpkins that were the culprit for my shopping spree? They were turned into these painted dollar store pumpkins. And the faux flowers and picks that filled my cart looked beautiful with my Aged Fall Mirror. 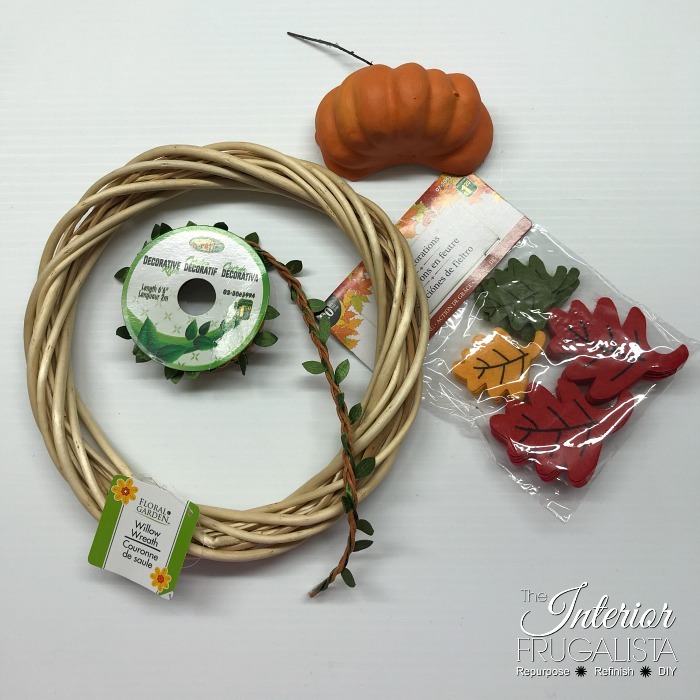 These are the supplies I used to make the super quick and easy Fall wreath. 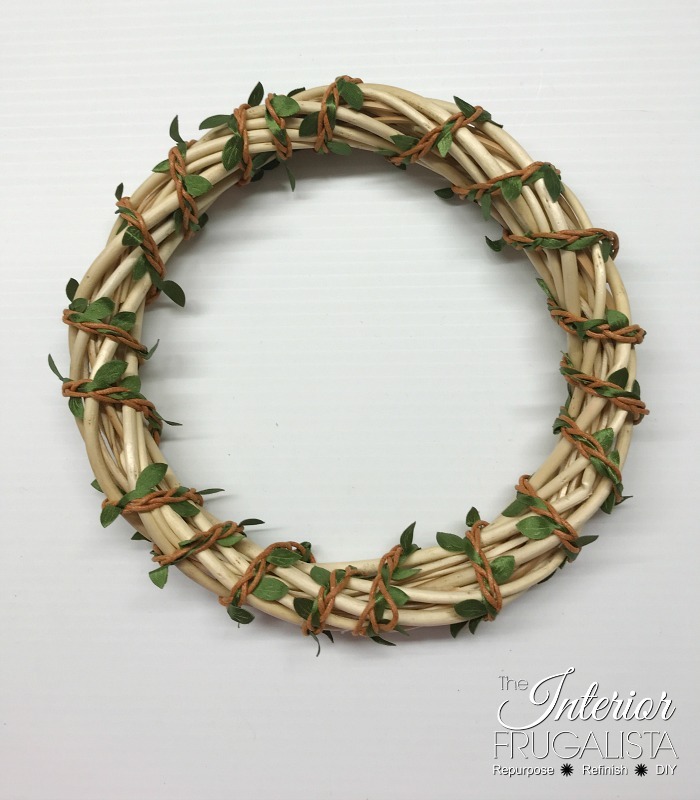 I simply wrapped one roll of decorative vine ribbon around the willow wreath and hot glued it in place on the bottom. 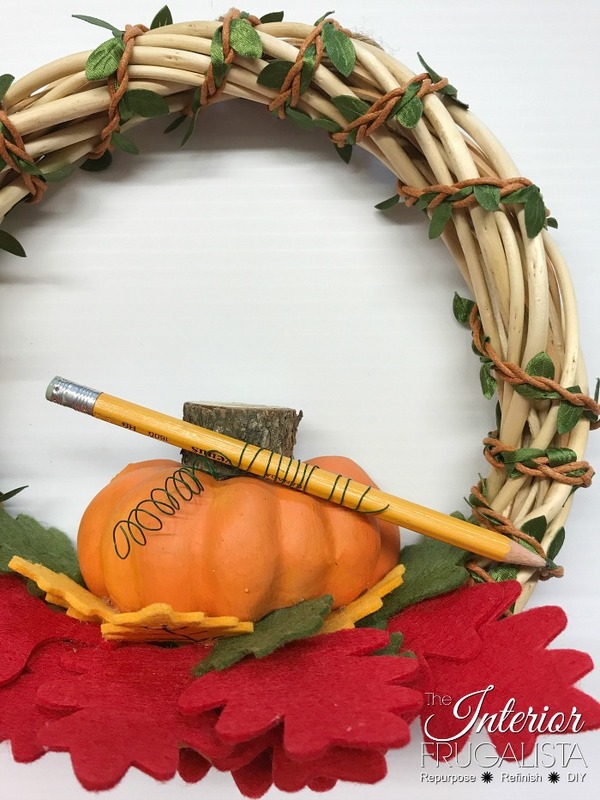 Next, I layered and glued felt leaves onto the bottom of the wreath. I turned the leaves upside down so the veins didn't show because, in all honesty, I find them kind of tacky. In my stash I had half a small styrofoam pumpkin leftover from my DIY Scrabble Tile Fall Banner. 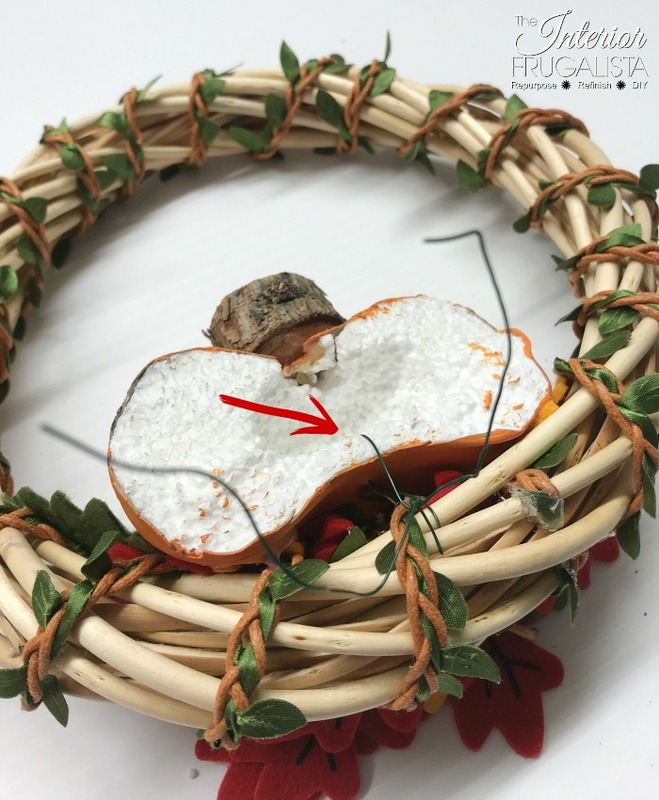 I hot glued it in the center of the felt leaves and secured it with florist wire on the back as pictured below. Next, I glued a slice of a tree branch, leftover from my Wood Slice Map Ornaments, for the stem. 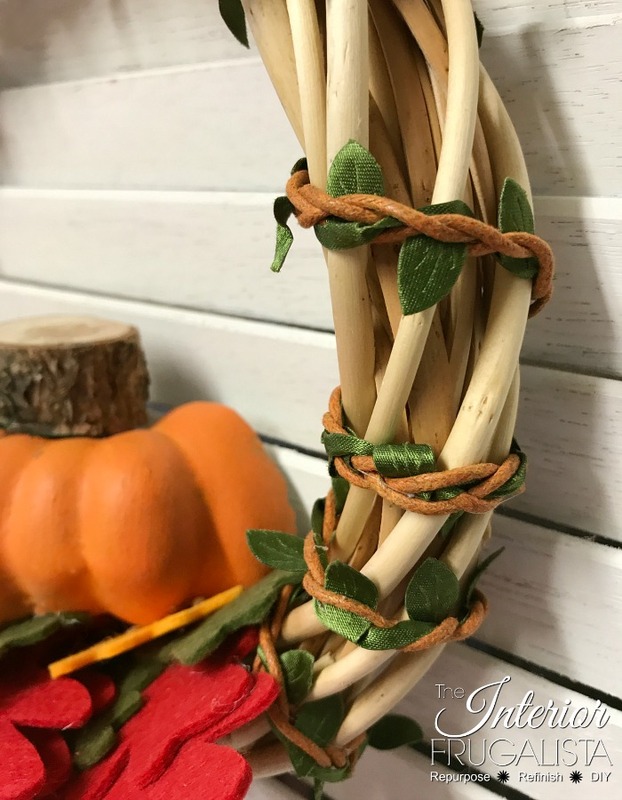 I twisted a piece of florist wire around the branch and wrapped the ends around a pencil to make tendrils. That's all there was to it. 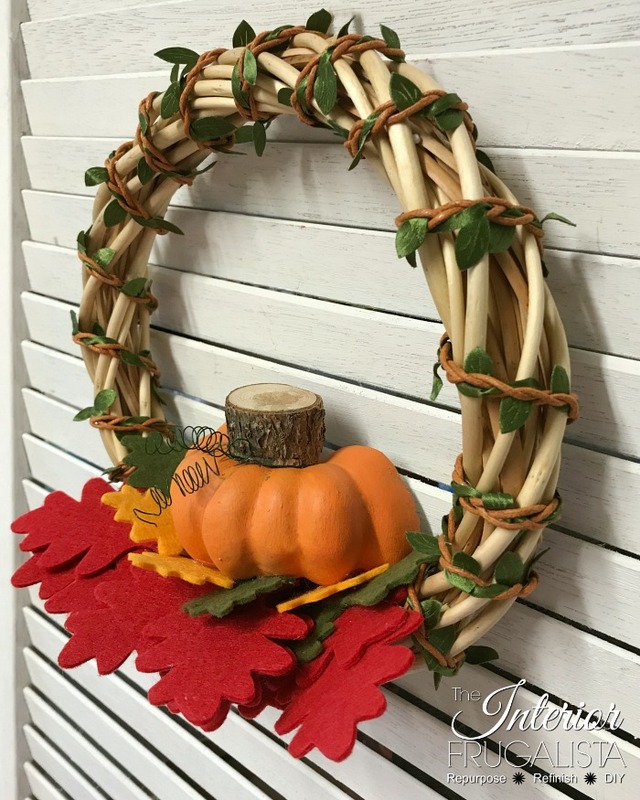 In five minutes or less you can make this cute inexpensive wreath. 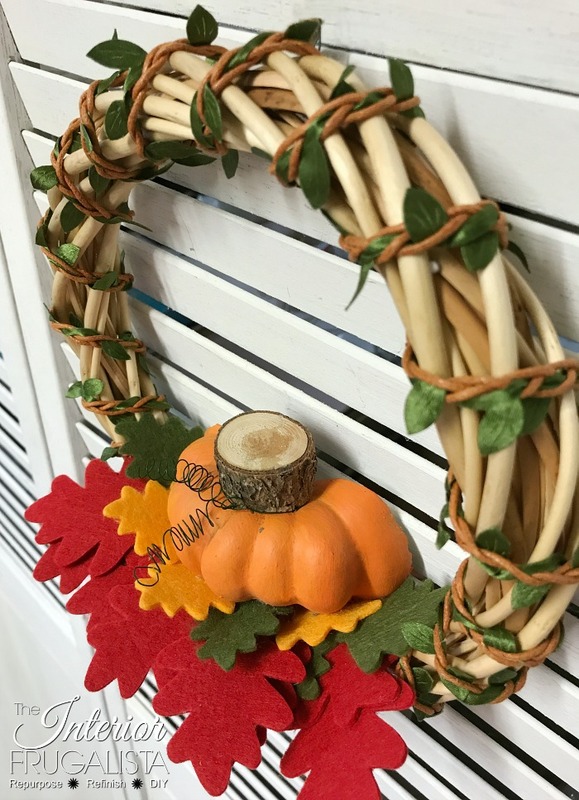 It's the perfect size for hanging on a mirror or cabinet door. 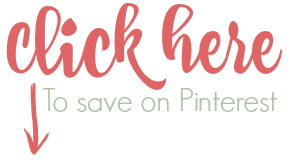 I bought two more rolls of this pretty vine ribbon in green and taupe. Haven't a clue what I'll do with them yet - perhaps next year. I should note that I bought all of my supplies at Dollarama. 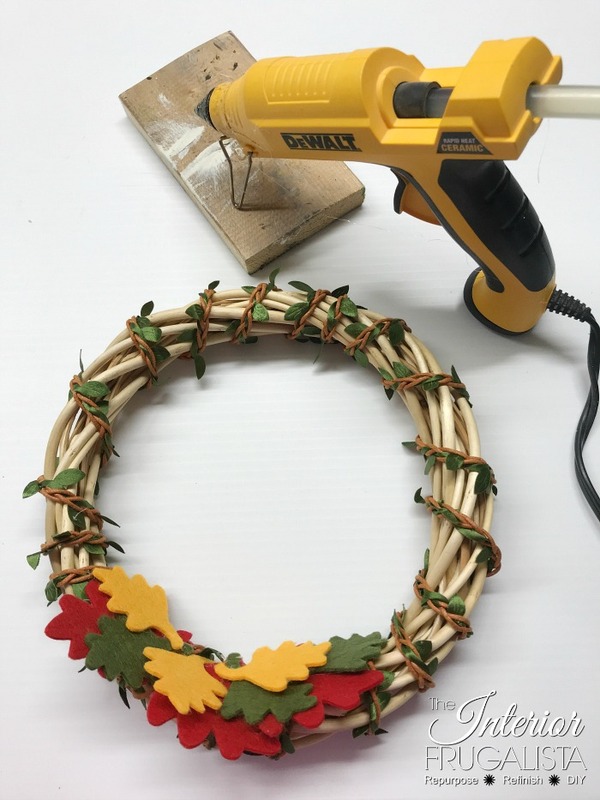 If you don't have one near you I've included affiliate links to the products I used for my wreath in the materials list below. See my disclosure policy. 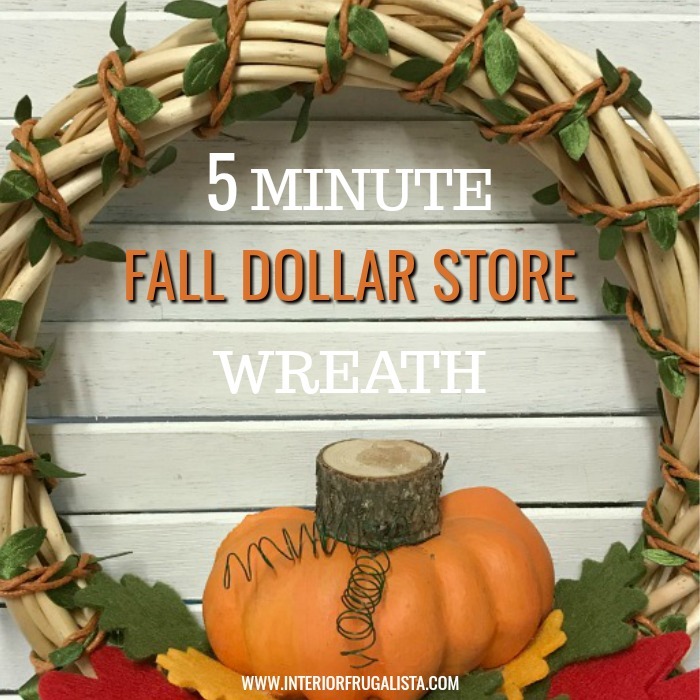 I hope you like my quick and easy Dollar Store Wreath for Fall. What things have been filling your shopping cart these days? 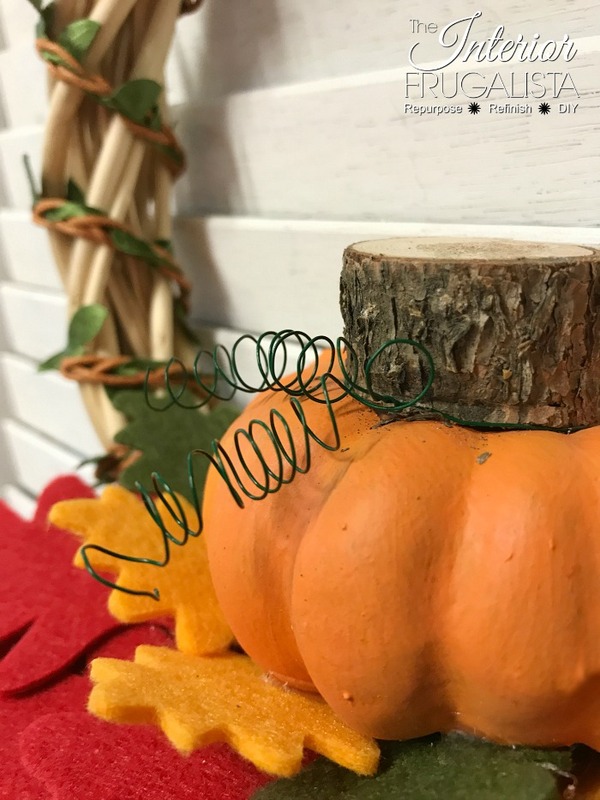 Have you made any Fall crafts using dollar store finds?